Madhur Jaffrey is such a talented lady and I eagerly awaited her memoir of her life growing up in India. Not only is she a highly respected food author (I absolutely adore Indian food), she's also an accomplished and award-winning actress. 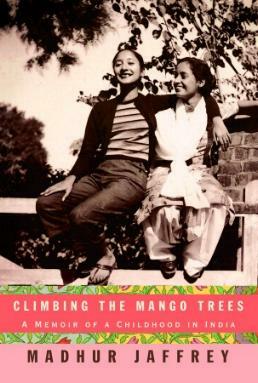 She relates her enchanting childhood in India along with vivid recollections of a time gone by. By all accounts, her early life was a life of privilege, not the norm when you think of India's dire poverty. Interestingly, Ms. Jaffrey not only recalls details of her family home, but also the foods they ate, the family legends and customs, and so many more fascinating tidbits from the 30's, 40s, and 50s. The joint-family arrangement made for a close and secure relationship for the children. With a wide variety of foods around them, it's no wonder Ms. Jaffrey was infused early on in her life with the love of food. Ironically, as a scholar, Madhur Jaffrey did not like the cookery part of her domestic science lessons. Thirty-odd recipes are included in this book, two of which are: Lamb with Spinach, and Chicken Curry (my favorite!). Her family tree, a diagram of which is included in the book, dates back to the 1500s. This is not her entire life story so I do hope she is penning the rest of her story. Please see my review of Ms. Jaffrey's Indian Cooking book. Conclusion - A page-turner. A purely delightful read which I highly recommend.